Toshiba has launched the new Satellite U500-1EX 13.3-inch touchscreen laptop for the UK. 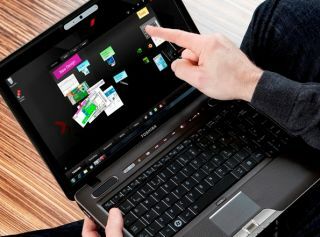 The notebook has full Windows 7 touch support, so it's packing Microsoft Surface Globe, Collage and Lagoon software. The ultraportable is based on Intel's Calpella platform, running variants of the Intel Core i3-330 processor. Other key specs are that the notebook will run Windows 7 Home Premium, have 4GB of memory and a 320GB drive. Toshiba says the notebook has a "glossy black keyboard" so we're not sure what it will be like to type on – previous shiny Tosh keyboards have left us somewhat frustrated. The notebook will have a recommended price of £649 when it goes on sale in the UK.